UPDATE: Looks like it's going to be a chilly one, but the ride is still on. The pub is expecting us and the food choice looks good. I have had a couple of confirmations but if you are planning on riding please do let me know. First full 3* of the year. A rolling 80km with 862m of climbing, but it will be at the bottom end of 3* pace for all those wishing to burn off some of those Christmas calories. The aim is an anti-clockwise loop south via the Letcombes, Lambourn, Chilton Foliat, Little Bedwyn and Hungerford to end up in Kintbury for lunch at the Blue Ball. The return will be via the Benhams, Boxford, Bright Walton, a possible stop for tea at the Saddleback shop if we are ahead, and the glorious swoop down Chain Hill to finish. If you are planning to come then please let me know so I can pre-warn the pub. Do bring lights as we may well finish after dusk. This was definitely a day for hard-core aficionados of winter cycling. The magnificent seven (including Martin Keane from Reading CTC) left WMP in good military style at exactly 0930, with the glorious leader failing to notice that Joy had yet to arrive. The route took us through the Letcombes and then up the rarely used climb up the back of Sparsholt Firs. Nick and Richard S took the opportunity to warm up by leading the way up the climb, which proved to be fortuitous as they met Joy at the top after she had ridden out from Wantage in the hope she might make contact. The (now) awesome eight then enjoyed the descent into Lambourn, albeit suffering borderline hypothermia in the process. More warming was then required, and was duly provided by the climb out of Lambourn to the B4000. The top of the climb saw us meet up with David and Ursula, after which the tremendous ten followed the roller coaster route over the Berkshire Downs (which seemed like mostly Ups) to Little Bedwyn and then Hungerford. Just outside the latter the leader suffered a puncture, amazingly the only one of the day. All was not lost though as the repairs meant the group arrived for lunch at the Blue Ball in Kintbury exactly on time at 1230; these things are strangely important for us naval types. Nicole joined the group for lunch, catching up on the gossip and providing most welcome moral support. A second leader's failing led the group to follow an 'alternative' route from Kintbury along a portion of the A4, before recommencing the climbing back up to the B400 via Hoe Benham. Boxford to Leckhampstead was a long climb made easier by the tailwind and a desire to keep warm in the intermittent sleet. We said goodbye to David and Ursula near Leckhampstead, and then completed the climb to the top of Chain Hill. 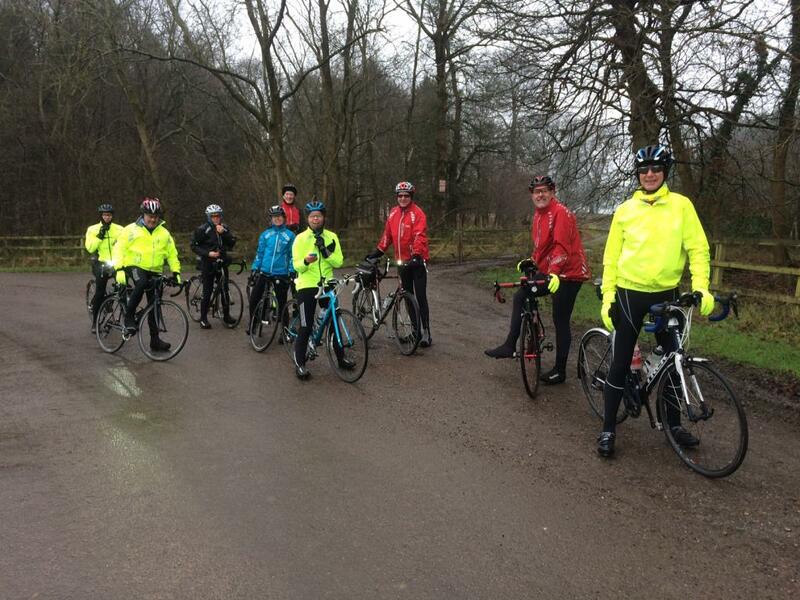 The descent of the latter, although very cold, was a great way to finish the ride and the group dispersed on arrival in Wantage. Fifty miles and 2,800+ft of climbing was an excellent return for such a dedicated group. Congratulations go to Joy for completing her longest ride ever, and her first CTC 50. The route was a nice one and I anticipate doing it or something similar again later in the year, hopefully with somewhat better weather. Nice ride! Thanks for leading - well worth it.